November 30, 2018 by Laurie Leave a Comment This post may contain affiliate links, which means if you click on a link and purchase something, I may earn a small commission (at no additional cost to you.) See my disclosure policy HERE. If you have any young men, old men, middle aged men – any man on your list still this year – do NOT miss this amazing deal! 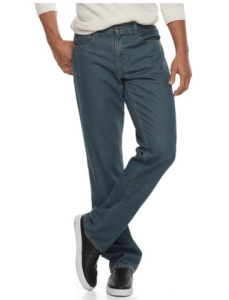 You can grab Men's Urban Pipeline Jeans for just $6.06 tonight – shipped to your home!!! This is an absolutely amazing deal, as these jeans are regularly $36. You then qualify for $10 Kohl's cash AND FREE Shipping! Pay just $42.45 which is just $6.06 each after Kohl's cash! You can also get free pick up in store if you're planning on being out and about!